If you want to integrate Omnisend with another system (e.g. 3rd party contact form), you can pass data to Omnisend (or get data) via our API. With every request, we require using API key for authorization purposes. You can create an API key by clicking on your account icon and choosing My Account. 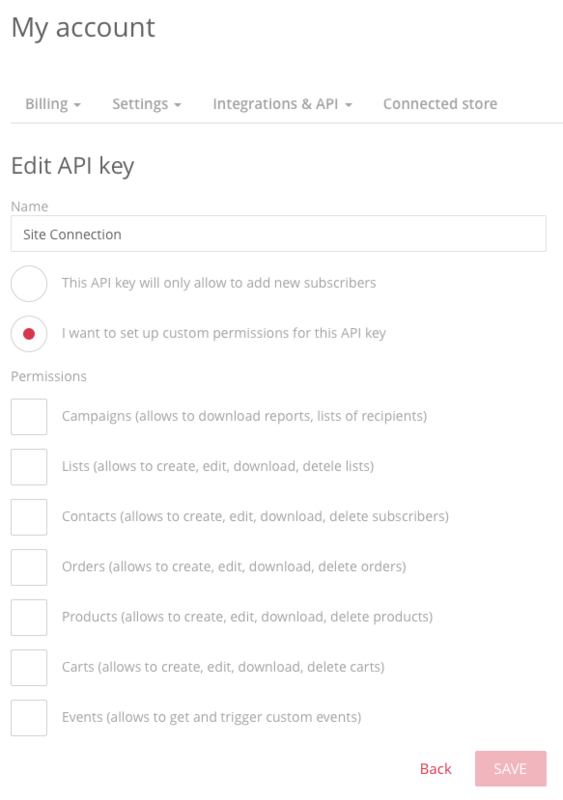 Once you're on your account settings, choose Integrations & API > API keys and follow the instructions bellow. to get only the titles (using this API call) and IDs of all subscriber lists in the particular Omnisend account (no actual subscribers can be downloaded or edited). List ID is required in order to add a new subscriber. to add new subscribers (using this API call). This type is sufficient when you only want to connect your site with your Omnisend account. These additional permissions are useful when you're doing a deep integration of Omnisend to your store, not just integrating a third party tool for a particular feature. To learn more about API integration, see our documentation. You can change these permissions any time in the future. Permissions are created to assure your API key only passes through the information you want to and does not abuse your integration. 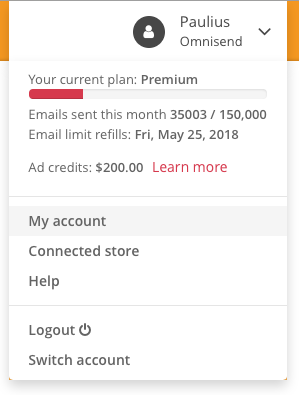 You can create a different combination of the permissions, for example, a key which has access only to List data and cannot reach Contacts (Subscribers) or Campaigns. That's it. You have created an API key. If you decide there are any changes needed to the permissions of a particular API key, keep in mind that it takes up to 5 minutes for those changes to reflect. Useful resource - Full Omnisend API documentation.